How many times have you tried to find a specific piece of information via Google search and either failed or wasted too much time? This happens regularly to many people. The Internet is very wide, and searching the web is really easy, but getting good results could be daunting at times. Good results are precise information with little or no irrelevancies. If you don’t know the right way to search, you could end up wasting a lot of your precious time wading through endless web pages. The following tips and tricks will help you beyond regular Google search. You will be able to make calculations and conversions, find word definitions and locate specific public information more easily. Google now stores public data for their users – time, weather, population and so on. If you need to make a phone call to a friend in another country, and you are not quite certain if the friend would be sleeping or at work. All you have to do is enter “Time in (country name)” e.g. “Time in India“, and hit search. You will be given the precise time of that place. To know if the weather will be favorable for a visit, enter “weather (state or county name)” e.g. “Weather New York” to get all the basic information on their weather condition. Note that you need to enter a state or county and not a larger geographical location that is composed of individual cities with varying weathers. This same principle applies to population. Simply enter “Population in South Africa” to get the most up-to-date population figure for South Africa. You can make unit conversions like “kg in pounds“, “dollar in yen“, “acre in square feet“, “seconds in minutes“, “kilobyte in bytes” etc. You can even convert specific measurements or amounts of money to other currencies e.g. 100 dollars in euros, 50 liters to milliliters, 100 kilometers to miles and 30 in binary. Sometimes, all you need is the definition of a word and not loads of irrelevant web pages. To get a direct answer on Google, enter “define:” before the word or phrase e.g. “define: gastronomy”. This will help you reduce the time spent wading through different web pages to get a good and correct definition. One of the fastest ways to get answers to simple mathematical queries is through Google search. You can times, add, subtract and even square numbers. To find the square root of a number, enter ” sqrt (number)” e.g. sqrt (49). You can get answers to “543.23 + 62.1”, “0.923 – 1.92” and so on. If all you can remember from a webpage is a particular phrase, you can still locate the webpage easily with this trick. Simply enter the phrase in quotation marks. 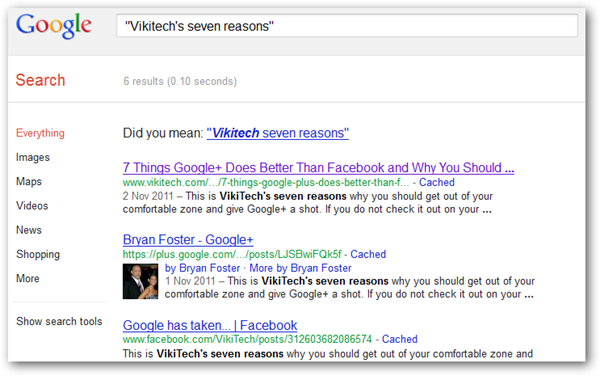 For example, you can enter “VikiTech’s seven reasons“, and Google will return only webpages that contain that exact phrase. Also, if you are looking for a complete version of a famous quote or who said it, simply enter what you remember in quotation marks; and Google will find a webpage that contains that exact phrase or clause. For example, you can enter “others judge us by what we” to get the famous quote by Henry Wadsworth Longfellow. You may remember an important post on TechNorms, but you cannot remember the full title at the moment. Instead of wading through an unlimited number of irrelevant pages, enter the phrase you remember in this format “site:www.technorms.com “text”and search. This will ensure your search results come from TechNorms.com alone. For example, if you remember the Firefox theme we referred to as a “nice piece of art”, you could enter ‘site:www.technorms.com “nice piece of art”‘. Similarly, you could search Google based on a particular document type. Maybe you are looking for a PowerPoint document you recently downloaded from the internet, and you can’t seem to locate it on your computer. Head over to Google, enter some or all of the name of the document and end with “filetype:ppt” for example “social media revolution filetype:ppt” to download it again. You don’t need to call your friend or tap the guy next to you to know the previous or next game of your favorite football team. Instead, enter the name of the team into Google search box to get a quick answer e.g. “Chelsea“, “Liverpool” etc. Also, you can find the basic information about any disease condition this same way. Just enter the name of the condition in the search box e.g. “Cholera” and search. Bear these tricks in mind and modify them as you deem fit. You should try as much as possible to avoid having to sniff through endless webpages to locate good information. Google ensures it gets information from trusted sources and even indicates those sources in some cases. So, save your precious time and imbibe these tricks. We welcome contributions from you in the comments section. Let us know the Google tricks that you have found really useful in your daily work.